Fly Fishing on the Historic Williams Ranch has been exceptional for the month of September. We have been 6 weeks or so out of runoff here in the Tarryall creek valley and the water temperatures remain cold with flourishing insect activity. Although we have a delayed prime season be sure to bring the big net. Guests are reporting 28 fish per day with many large rainbows and browns taken on the surface with lengths of 20 plus inches. Fooled with late season caddis and fat grasshoppers; dry fly fishing is prime this early September at the Historic Williams Ranch. 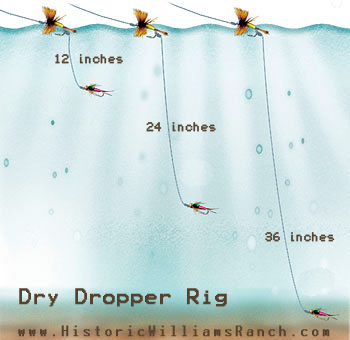 A productive method for fishing the 2 miles of Tarryall Creek on the Historic Williams Ranch is the dry-dropper method. Rig your fly rod with a 7 ½ to 9 foot leader with a buoyant dry fly or hopper pattern tied on to the end. From the bend of the first dry fly tie on 12 – 36 inches of fluorocarbon tippet with a standard clinch knot. At the end of the tippet section tie on a standard nymph pattern that drops below the dry. We recommend a nymph with a tungsten bead head. Classic patterns like the prince nymph, pheasant tail, biot stonefly nymph, or any variation. 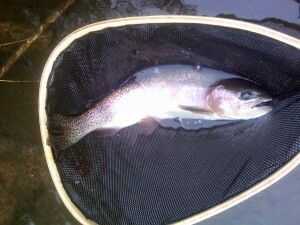 Dry: Elk Hair Caddis 16-18, Slick Water Caddis 18,Charlie Boy Hopper 12, Dave’s Hopper 12-14. Historic Williams Ranch is located 5 miles down stream of Tarryall Reservoir at mile marker 25 with just over 2 miles of premier private fly fishing. This entry was posted in Current Conditions, Fly Fishing, Fly Fishing Reports. Bookmark the permalink.